2012-13 Post Season Tournament Checklist . 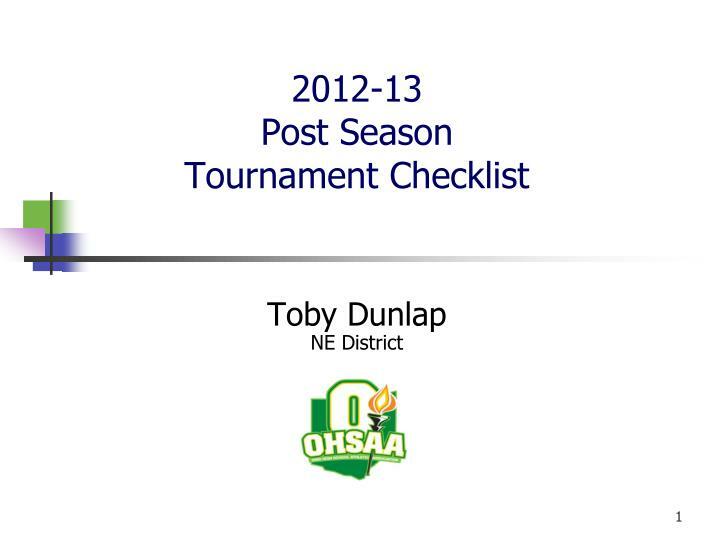 Toby Dunlap NE District. Pre-Tournament. Head Official - call the Tournament Manager prior to the tournament (usually the week before the scheduled date). Some general questions to ask: Names of other confirmed contracted officials. Names of other confirmed contracted officials. For a District level tournament I always ask the Tournament Manager for additional officials to assist at weigh-ins. 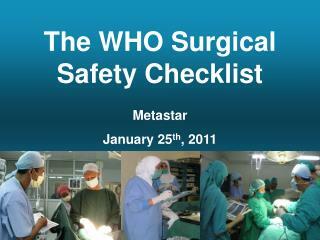 Will a physician and/or certified trainer be present at weigh-ins? Will a physician and/or certified trainer be present during the tournament? Confirm starting times and tournament format. 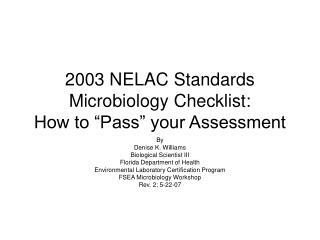 Establish responsibility for body fluid clean-up and confirm that each mat will have proper clean-up supplies (officials should not be responsible for clean-up). Establish time of pre-tournament coaches' meeting and make sure that you are placed on the agenda (see meeting topics below). 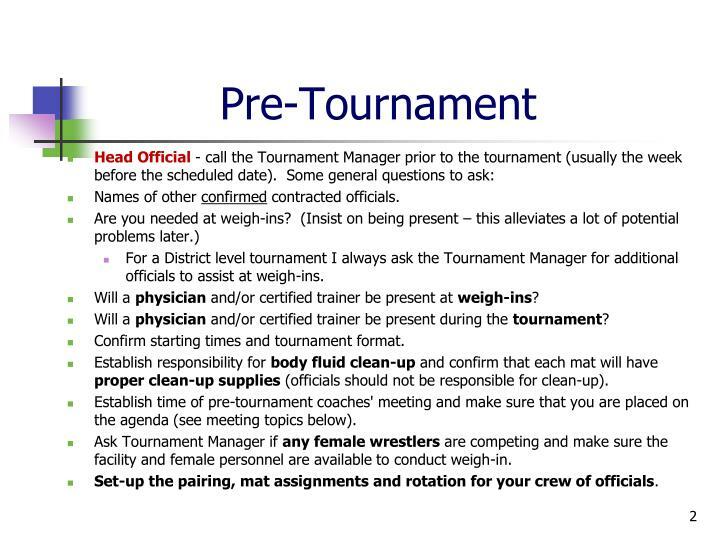 Ask Tournament Manager if any female wrestlers are competing and make sure the facility and female personnel are available to conduct weigh-in. Set-up the pairing, mat assignments and rotation for your crew of officials. Head official - Arrive at least one-half hour before weigh-ins if you are conducting grooming, skin and equipment checks. 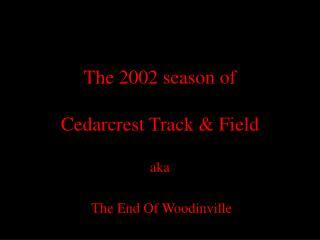 Otherwise at least 1½ to 1 hour prior to scheduled starting time (depending on the scheduled coaches' meeting start). All officials - Plan on arriving at the tournament site at least one hour before the scheduled start. All officials - if you anticipate being late, call to inform tournament management and the head official. Head official - Introduce yourself to the Tournament Manager. 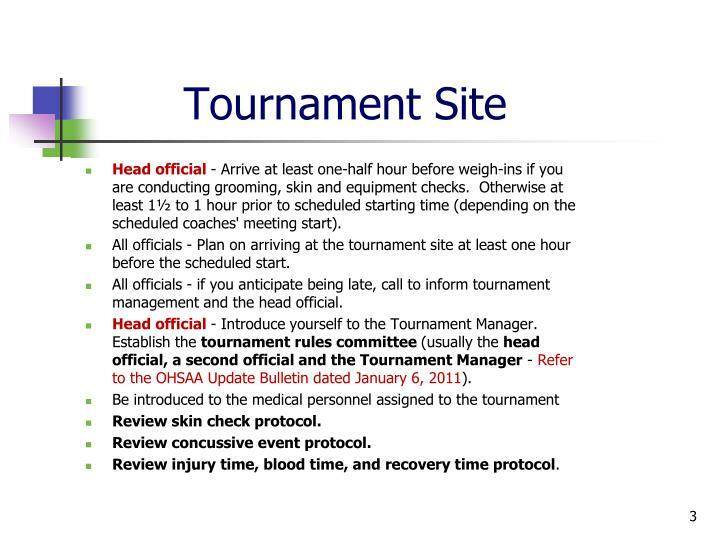 Establish the tournament rules committee (usually the head official, a second official and the Tournament Manager - Refer to the OHSAA Update Bulletin dated January 6, 2011). 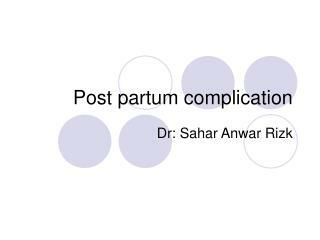 Review injury time, blood time, and recovery time protocol. 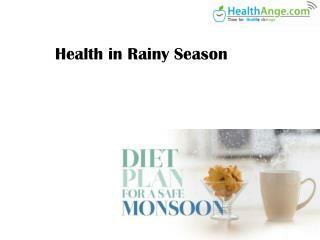 Check skin, hair, nails, mouth and tooth protector (braces), hair covers (if using). 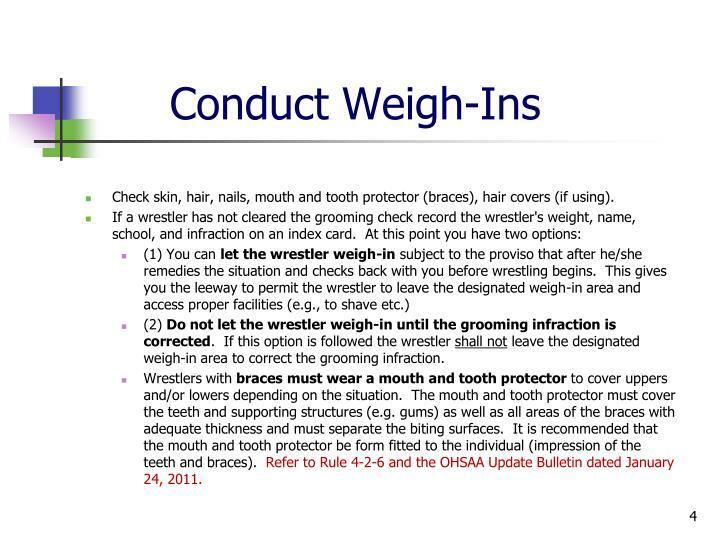 (2) Do not let the wrestler weigh-in until the grooming infraction is corrected. If this option is followed the wrestler shall not leave the designated weigh-in area to correct the grooming infraction. Wrestlers with bracesmust wear a mouth and tooth protector to cover uppers and/or lowers depending on the situation. The mouth and tooth protector must cover the teeth and supporting structures (e.g. gums) as well as all areas of the braces with adequate thickness and must separate the biting surfaces. It is recommended that the mouth and tooth protector be form fitted to the individual (impression of the teeth and braces). Refer to Rule 4-2-6 and the OHSAA Update Bulletin dated January 24, 2011. Wrestlers with hair longer than allowed by rule, braided or rolled must wear a legal hair cover. 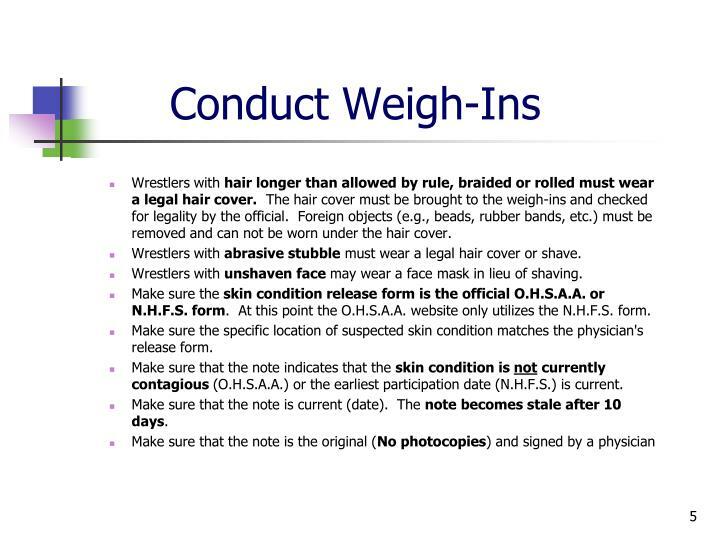 The hair cover must be brought to the weigh-ins and checked for legality by the official. Foreign objects (e.g., beads, rubber bands, etc.) must be removed and can not be worn under the hair cover. Wrestlers with abrasive stubble must wear a legal hair cover or shave. Wrestlers with unshaven face may wear a face mask in lieu of shaving. Make sure the skin condition release form is the official O.H.S.A.A. or N.H.F.S. form. At this point the O.H.S.A.A. website only utilizes the N.H.F.S. form. Make sure the specific location of suspected skin condition matches the physician's release form. Make sure that the note indicates that the skin condition is not currently contagious (O.H.S.A.A.) or the earliest participation date (N.H.F.S.) 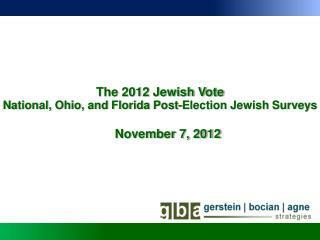 is current. Make sure that the note is current (date). The note becomes stale after 10 days. Weigh-in is to be conducted by weight class (head to head) or by team. 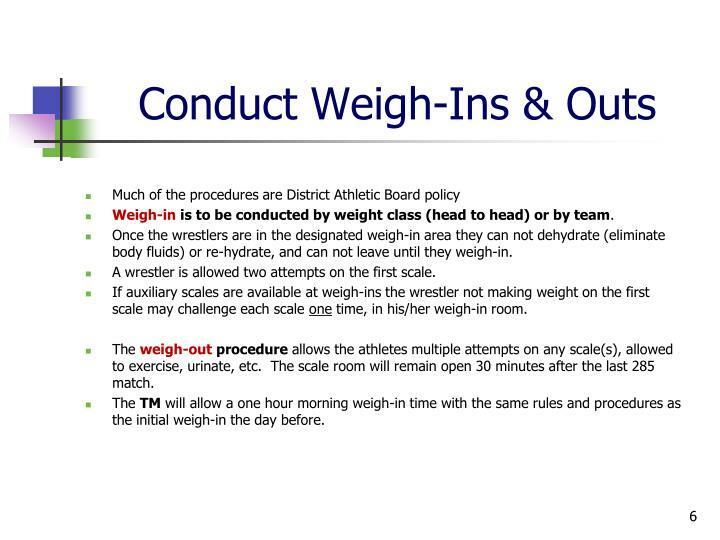 Once the wrestlers are in the designated weigh-in area they can not dehydrate (eliminate body fluids) or re-hydrate, and can not leave until they weigh-in. A wrestler is allowed two attempts on the first scale. If auxiliary scales are available at weigh-ins the wrestler not making weight on the first scale may challenge each scale one time, in his/her weigh-in room. The weigh-out procedure allows the athletes multiple attempts on any scale(s), allowed to exercise, urinate, etc. The scale room will remain open 30 minutes after the last 285 match. The TM will allow a one hour morning weigh-in time with the same rules and procedures as the initial weigh-in the day before. Check legality of mats and wrestling area for safety. Have tournament management correct any unsafe or illegal mat set-ups. 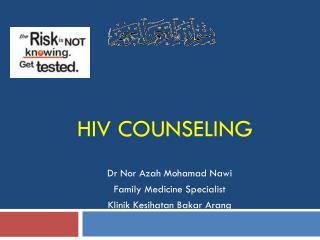 Make sure that the coaching area is clearly marked. Meet with all officials conduct introductions as necessary. 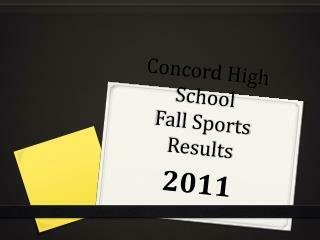 Communicate official's pairings and assign mats. 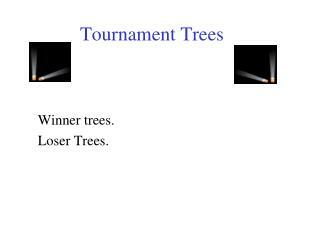 Review tournament format and logistics. As officials we must afford the opportunity for a coach to approach the table. 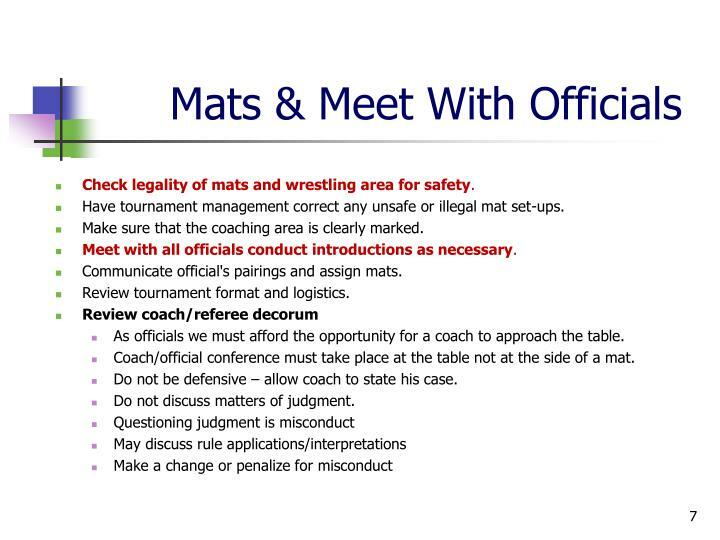 Coach/official conference must take place at the table not at the side of a mat. Do not be defensive – allow coach to state his case. Do not discuss matters of judgment. Be as active and assist with the same latitude of mobility as the referee. Do not stand at the edge of the mat with your arms folded. Do gaze into the stands. Mirror the referee (180º opposite). 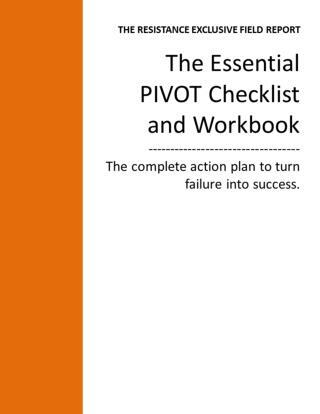 Change levels and look underneath in tie-up and head lock situations. Bring infractions to the referee's immediate attention. Be discrete when communicating stalling. Cover the front side (when action rotates towards you) and wait for the referee to catch up to the action before rotating 180°. 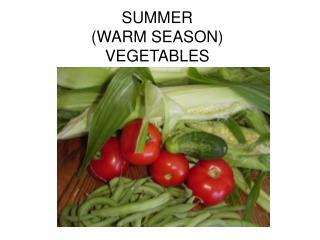 Cover the top side in near fall situations. The assistant should not look for the fall. Be immediately available to give your opinion on a situation when asked by the referee. Never be afraid to voice an opinion when you disagree with a call or ruling. Support the referee when a close but correct call is made (shaking your head in approval does a lot to diffuse a coach from potentially objecting to the call). Never communicate with a coach in judgment situations. Direct the coach to the referee. Be in charge of the injury time/recovery time clock. Communicate elapsed time to coach. Stay with the wrestlers in the center of the mat when the referee is at the table. 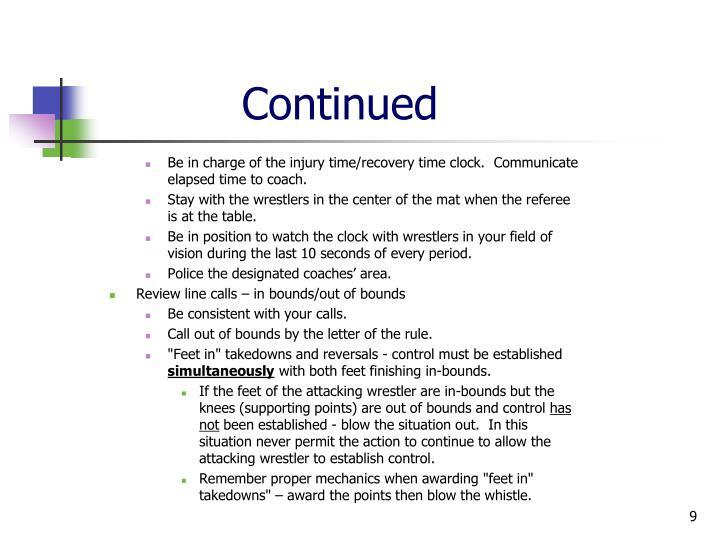 Be in position to watch the clock with wrestlers in your field of vision during the last 10 seconds of every period. Police the designated coaches’ area. Be consistent with your calls. Call out of bounds by the letter of the rule. "Feet in" takedowns and reversals - control must be established simultaneously with both feet finishing in-bounds. If the feet of the attacking wrestler are in-bounds but the knees (supporting points) are out of bounds and control has not been established - blow the situation out. In this situation never permit the action to continue to allow the attacking wrestler to establish control. Remember proper mechanics when awarding "feet in" takedowns" – award the points then blow the whistle. Review correction of errors with the officiating crew. Bad time must be corrected before the start of the subsequent period. All points, penalties and injury time cancelled during the bad time period, except flagrant misconduct, penalties for illegal holds, unsportsmanlike conduct, unnecessary roughness, blood time. Must be corrected prior to the offended wrestler leaving the mat area if additional wrestling is needed. 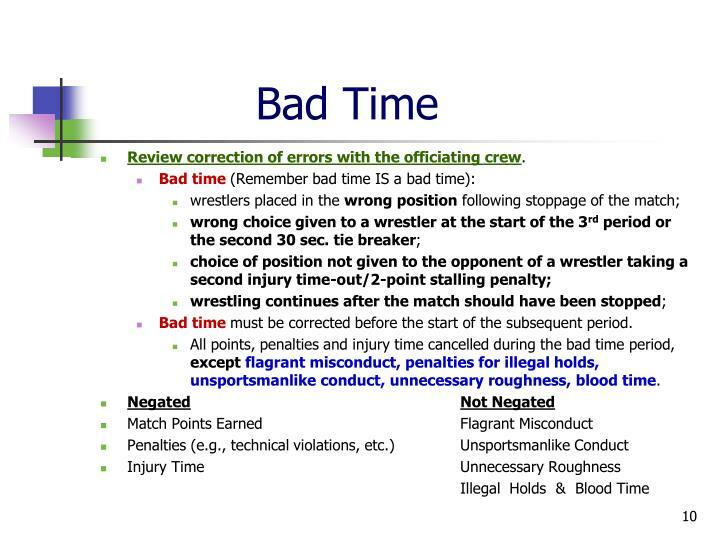 If additional wrestling is not necessary the error may be corrected so long as the offended wrestler or his/her coach remain in the wrestling area. 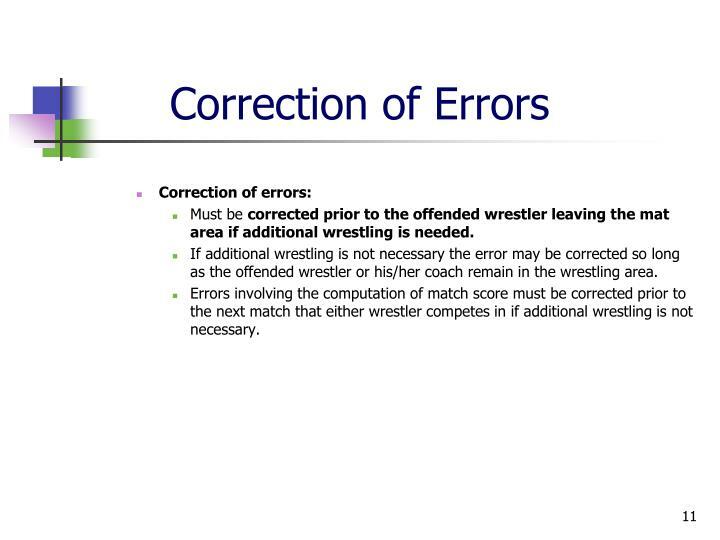 Errors involving the computation of match score must be corrected prior to the next match that either wrestler competes in if additional wrestling is not necessary. 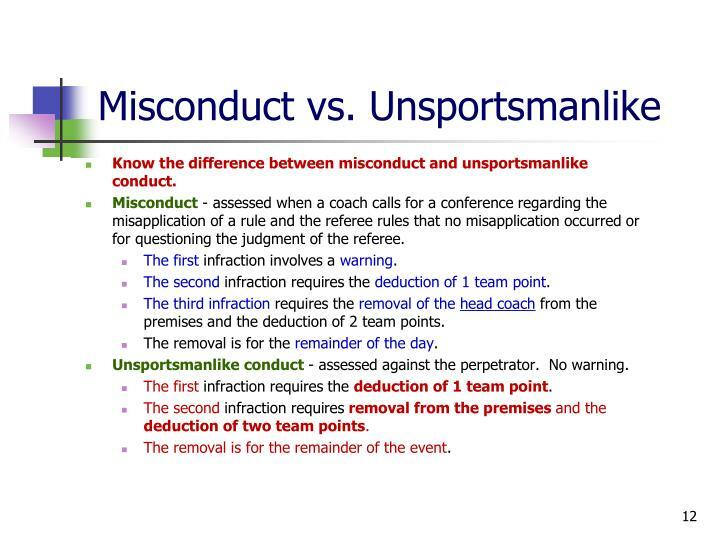 Know the difference between misconduct and unsportsmanlike conduct. Misconduct - assessed when a coach calls for a conference regarding the misapplication of a rule and the referee rules that no misapplication occurred or for questioning the judgment of the referee. The first infraction involves a warning. The second infraction requires the deduction of 1 team point. 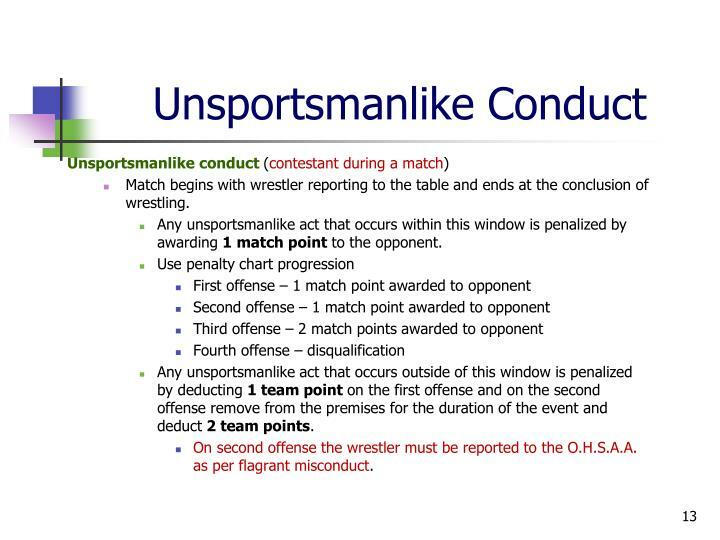 The third infraction requires the removal of the head coachfrom the premises and the deduction of 2 team points. The removal is for the remainder of the day. Unsportsmanlike conduct - assessed against the perpetrator. No warning. The first infraction requires the deduction of 1 team point. The second infraction requires removal from the premises and the deduction of two team points. The removal is for the remainder of the event. Match begins with wrestler reporting to the table and ends at the conclusion of wrestling. Any unsportsmanlike act that occurs within this window is penalized by awarding 1match point to the opponent. Any unsportsmanlike act that occurs outside of this window is penalized by deducting 1 team point on the first offense and on the second offense remove from the premises for the duration of the event and deduct 2 team points. On second offense the wrestler must be reported to the O.H.S.A.A. as per flagrant misconduct. 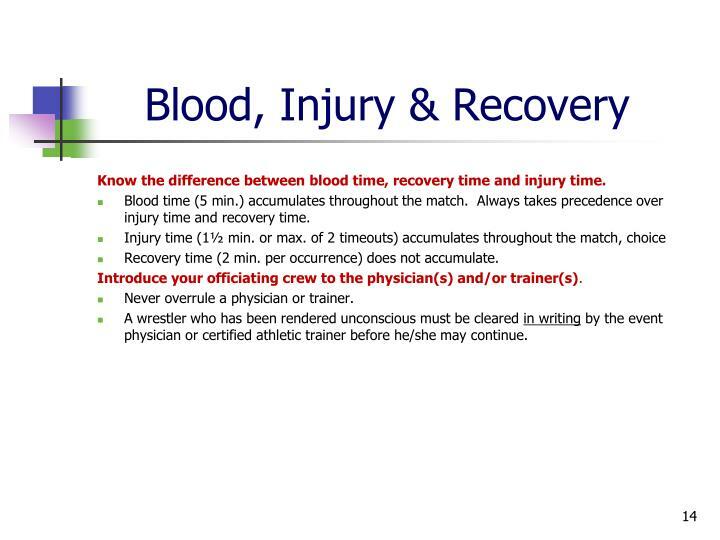 Know the difference between blood time, recovery time and injury time. Blood time (5 min.) accumulates throughout the match. Always takes precedence over injury time and recovery time. Recovery time (2 min. per occurrence) does not accumulate. Introduce your officiating crew to the physician(s) and/or trainer(s). 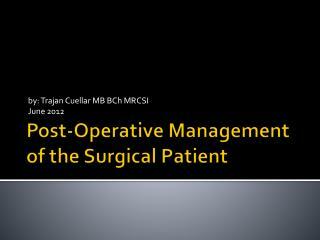 Never overrule a physician or trainer. A wrestler who has been rendered unconscious must be cleared in writing by the event physician or certified athletic trainer before he/she may continue. First & foremost EMPHASIZE sportsmanship – unsportsmanlike conduct at this stage comes with grave consequences. Remind coaches that they are responsible for the wrestler being legally equipped and ready to wrestle. Ask coaches if they need any equipment, tapping, bracing, etc. not checked at weigh-ins for legality. Remind the coaches re shoe lace securing (tape, zipper, Velcro® and at the very least, double knotting). Remind coaches that only two team personnel are permitted in a corner. Remind coaches to stay within the designated coaching area (behind the line). Review the proper way to address the referee if there is a question. 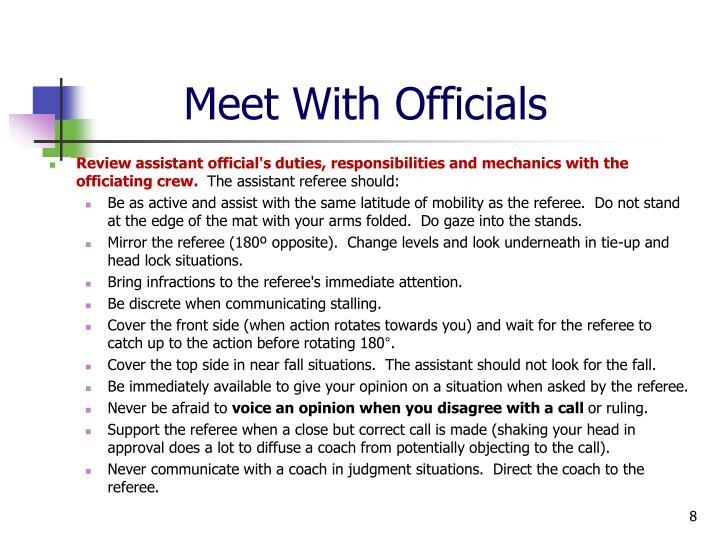 Coaches must not address the assistant referee (Assistant referee should direct the coach to the referee if a question needs to be addressed). 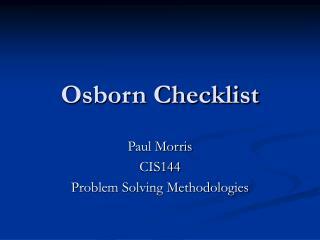 Review bad time and correction of error situations. Make sure to emphasize that if the coach feels that an error has been made it should immediately be brought it to the referee's attention. 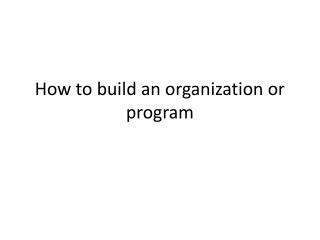 Ask coaches if they have any questions. 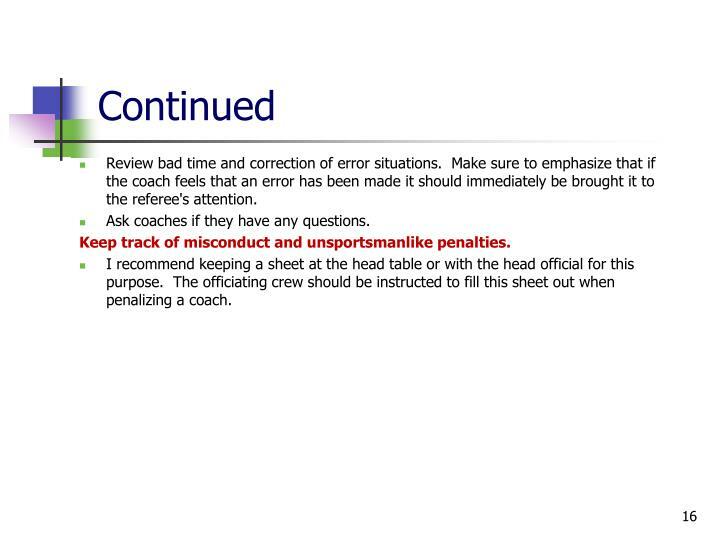 Keep track of misconduct and unsportsmanlike penalties. I recommend keeping a sheet at the head table or with the head official for this purpose. The officiating crew should be instructed to fill this sheet out when penalizing a coach. 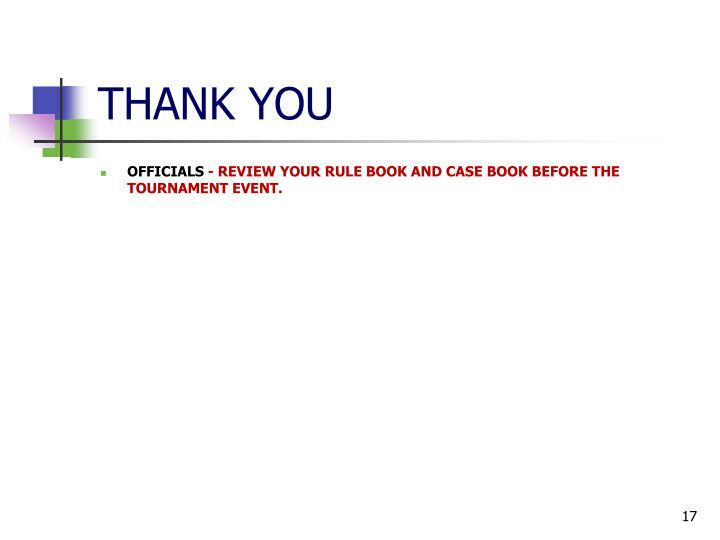 OFFICIALS - REVIEW YOUR RULE BOOK AND CASE BOOK BEFORE THE TOURNAMENT EVENT. 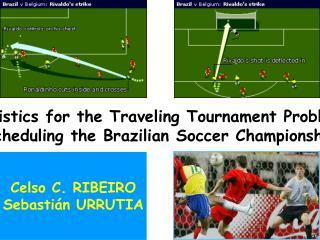 Heuristics for the Traveling Tournament Problem: Scheduling the Brazilian Soccer Championship -Heuristics for the traveling tournament problem: scheduling the brazilian soccer championship. celso c. ribeiro sebastián urrutia. summary. 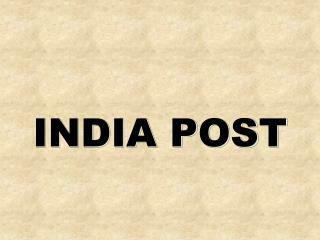 The Post Office Module -. 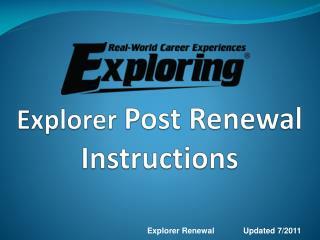 manhattan’s post office module is a private e-mail system open only to members of your virtual classroom. as always, a red star on a module’s button means there’s one or more unread messages inside.